I don't want to sound like I'm a Festival junky. But since the new film is starting to tour, the images I have that make up my life do consist mainly of showing up at film events with large amounts of people, in historical screening venues. 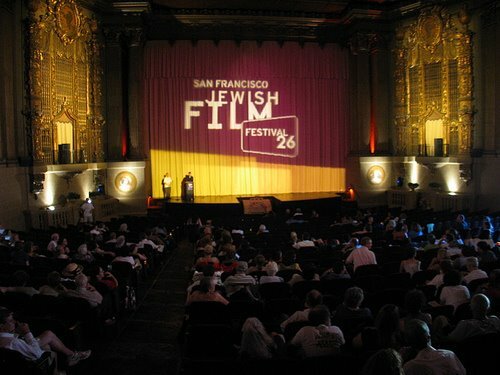 A second before the San Francisco Jewish Film Festival, becomes but one more memory, and with it the US premiere of my film, I decided to record a few last souvenirs from that trip. Among those souvenirs are pictures from the festivals website that were posted on FLICKR. The fabolous Castro Theater inside and outside. Ravit Markus, my producing partner. 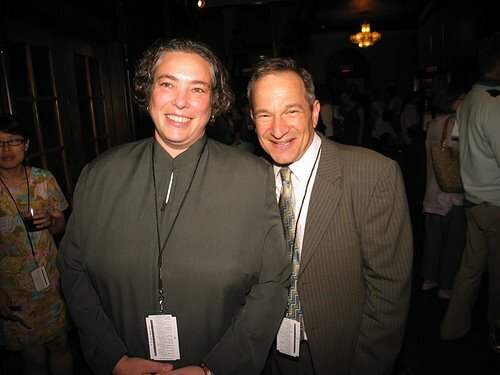 The wonderful people running the festival : Peter Stein and Nancy Fishman. 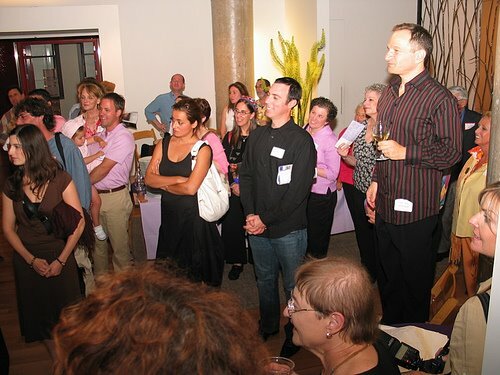 Me at the Shabbat dinner that was quoted in the Chronicle and Peter Stein in the center. Another souvenir that will always be there in cyber space, is my quote in the San Francisco Chronicle. I was a little pissed in that interview. It was supposed to be a very simple interview about the Shabbat dinner. But I was shocked from what I had seen before I got to the dinner and so gave a piece of my mind to the reporter there. Israeli's are getting killed in a war for survival, 200 rockets a day are landing on the north of Israel. 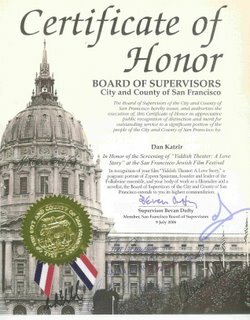 Yet people in San Francisco allowed their self hatred to kick in and use the opportunity to bad mouth our soldiers battling in Lebanon and in Gazza for the safety of our people . I know it wasn't the most tactical thing to say. But what could I do. Being an artist means allowing yourself not only to say what is politically right, but also what is honest and what one feels is the moral thing to say. As was obvious from the article, All the other artists talked about their films, while I talked about the reality of war, and what disturbed me most, hypocracy. But it seems the reporter didn't lik my answer, cause she didn't even bother to write the name of my film, unlike all the other filmmakers whose films were mentioned. Doesn't matter. I feel good about giving her a piece of my mind. My two cents, to the effort to make the world a more truthful place. May the real war, the war for truth continue. Gathered around a very large challah Friday evening at the Sabbath dinner put on by the San Francisco Jewish Film Festival. Before the traditional breaking of the bread, everybody was asked to say something about themselves. 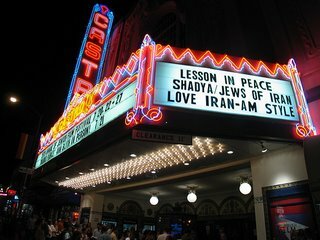 When it was Israeli filmmaker Yoram Honig's turn, he said, "I came here on a Hezbollah rocket.'' His line drew a lot of laughs, but also brought up a deadly serious subject that can't help but impact this year's festival: the heavy fighting in the Middle East. Honig, who is a major in the Paratroopers Reserve in Israel, wasn't sure if he would be called up before he was scheduled to be in San Francisco with his documentary, "First Lesson in Peace.'' Ironically, the film is about an experimental school for Jewish and Palestinian children where he sends his daughter. Classes are taught in Arabic and Hebrew, and understanding between the two nationalities is stressed. Of the 10 directors from Israel who were to be here, only one, Vidi Bilu, dropped out at the last minute, for a reason unrelated to the escalating combat. A new project of hers suddenly got a green light. 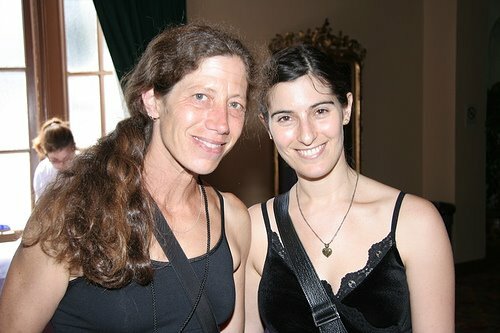 Her co-director, Dalia Hager, made the trip to represent their festival entry, "Close to Home," which addresses the Israeli-Palestinian issue in an understated way, through a story of two Israeli army buddies who happen to be women. "I came, but I'm in a bad mood,'' Hager said. It was hard to stay glum for long with all the goodwill floating through the room. The Sabbath dinner brings together not only filmmakers and festival board and staff members, but also their families. A dozen or so children, some still in their parents' arms, stayed remarkably quiet through the lighting of the Shabbat candles and a series of prayers. The one over the wine is supposed to be said over red vino. But it was a condition of getting a spiffy new space this year in the Hills Bros. Coffee building on the Embarcadero that white be used instead. The older kids participated in breaking off a piece of challah, which they gnawed on as they headed for a bountiful buffet table. 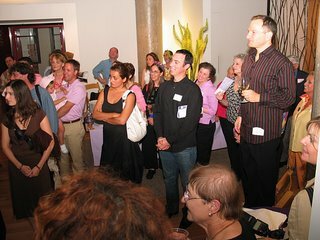 "This is so different from many typical film festival parties, where it's often as much about whom you can't get close to and what list you are not on,'' said Stein, who's been going to these suppers since they were at someone's house. 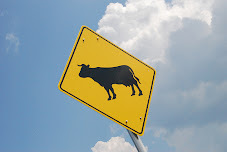 For the secular Jews attending "marking the Sabbath is a very unusual thing,'' he added. In observance of the holiday, no films were screened Friday, which for other festivals is a big night at the box office. For filmmaker Dan Katzir, it was a perfect antidote to a conversation he had overheard on opening night that still upset him. "People were saying they wanted to boycott the festival because of what Israel was doing,'' he related. 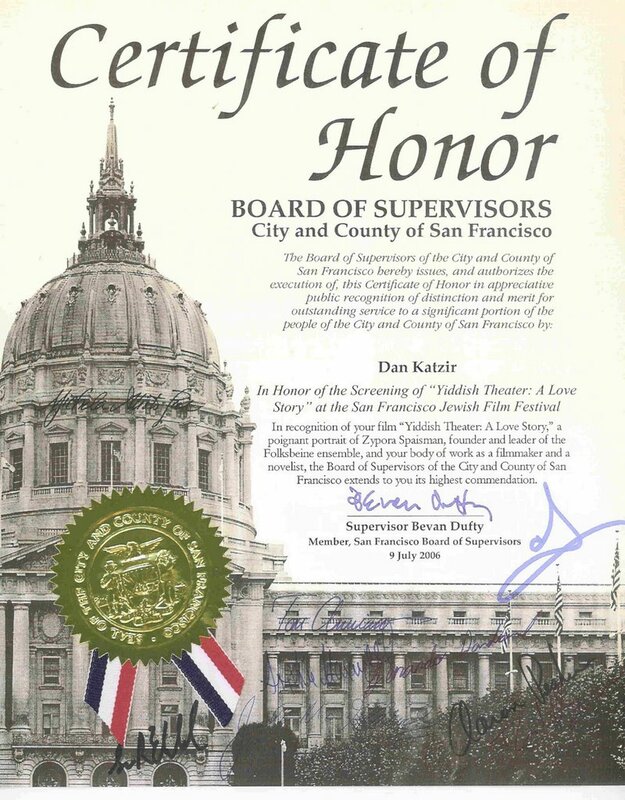 Katzir, whose great uncle, Ephraim Katzir, was the fourth president of Israel and whose grandfather was killed in a terrorist attack, said he was "ashamed for San Francisco'' to hear expressed that kind of attitude, which he finds narrow-minded. Many of the films being shown are on personal subjects far removed from the politics of the day. Doug Block brought his father and stepmother, the subjects of his revealing documentary, "51 Birch Street,'' to the Shabbat observance. Block's perception of his parents' marriage as happy was shattered when his mother died unexpectedly at 78, and he discovered from her diaries that she had a lover. His father, Michael Block, quickly started seeing his secretary from 40 years ago, who is now his wife. "Hi, I'm the wicked stepmother,'' Kitty Block said, introducing herself with a broad smile. In an elegant black sheath and high espadrilles, Tanaz Eshaghian was the most stylish filmmaker to break bread on Friday. You wouldn't think anyone with her looks would have a hard time finding her own dates. But in "Love Iranian-American Style'' she documents her family's numerous attempts to set her up. "My Iranian family is obsessed with getting me married before it's too late,'' Eshaghian said, explaining that "too late'' for them means age 25. As a condition of going on these fix-ups, the men had to agree to talk into a camera. E-mail Ruthe Stein at rstein@sfchronicle.com.